There is an after school club (which we call Waiting House) available for Pre-Prep and Nursery children. It starts at 3.30pm when school finishes, and children can be collected any time up to 6.00pm. There are also numerous different activities from which to choose. Generally they last one hour, until 4.30pm, and vary depending on the time of year. Swimming, gardening, IT club, Lego, forest fun, football and cookery are just a few of the activities on offer. Children are escorted to and from their after school activities and spend most of the remaining time outside in our wonderful all-weather playground. Children who are not collected after their activity, can stay at Waiting House up till 6.00pm. 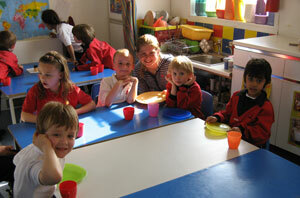 Nursery children are given a ‘picnic’ tea while Pre-Prep children are taken up to hot tea in the Prep School at 5.00pm. The cost of Waiting House is £3.10 per half hour and although we like to have an approximate idea of numbers, we are very flexible and parents can ring school at any time during the day to ‘book in’ their children.